Join Team Santa Inc. until the end of August 2018, and SAVE ANOTHER 10 PERCENT OFF our popular LED lighted palm trees. These lighted palm trees trees are totally outrageous when used for pool side decor, either residential and/or commercial. Your guests will ask you where you bought the cool palm trees, just watch. 😎 Buy now and save 20% off our selection of outdoor lighted palm trees. Enjoy savings until August 31, 2018 or while supplies last. 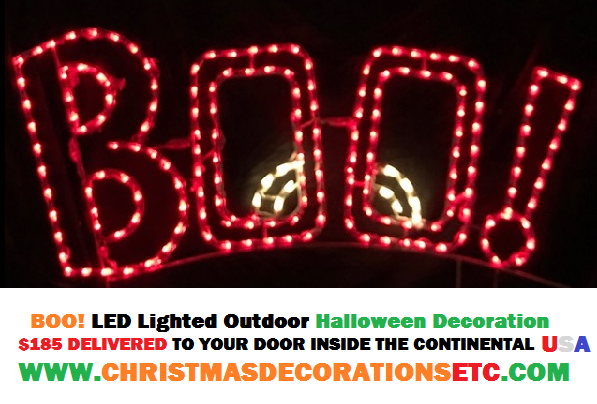 Important: This promotion is only for LED or standard incandescent lighted palm trees. 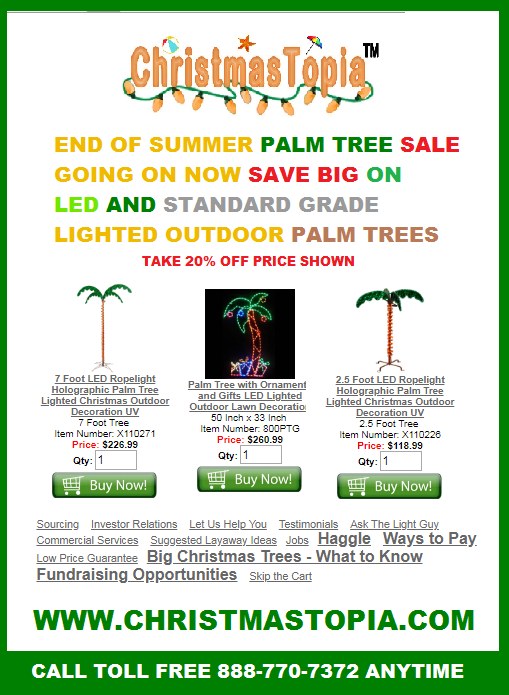 This offer does not include any other palm trees Team Santa Inc. may sell on any of its web sites. Enjoy your today and see you tomorrow. 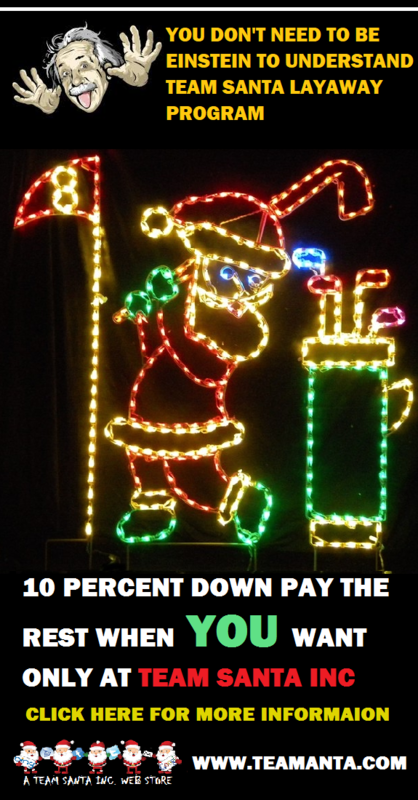 Reaction to the Team Santa Inc. new “Layaway Program” ‎has been terrific. 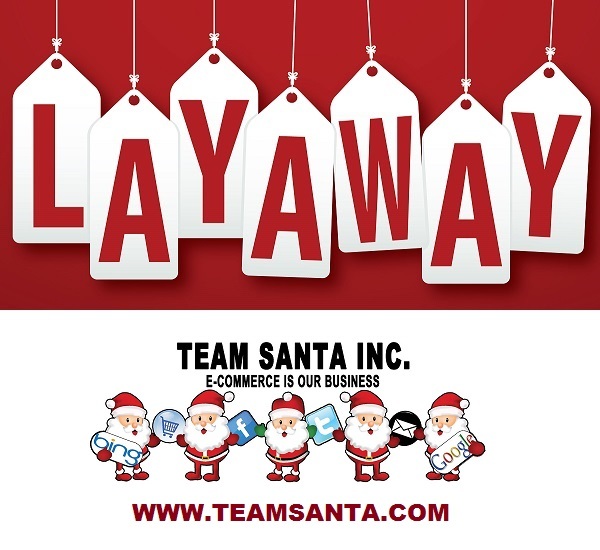 Dozens of consumers have already taken advantage of the convenience related to the payment process.‎ If you didn’t hear, the new Team Santa Inc. layaway process is simple. Order your products by sending an email to support@teamsanta.com. In the email, list the products making up your layaway. Please also include the shipping address. We will send you an online invoice by email. Make your deposit by putting a minimum 10 percent down ($20 minimum) and then pay off your order when you want to. 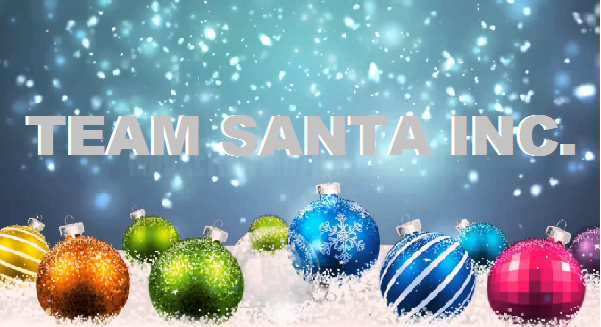 ‎After you make your 10% deposit (minimum $20) Team Santa Inc.‎ will assemble and pack your order, then store it for you until you are ready for it by completing the payment process. Payment totally simple. We use Paypal as our payment processor. What’s nice is that In addition to using your credit/debit card for payment, you can also make payment with a Pay Pal account if you have one. You will receive a very nice invoice that you can print out if you like. Get up to 6 months to pay. 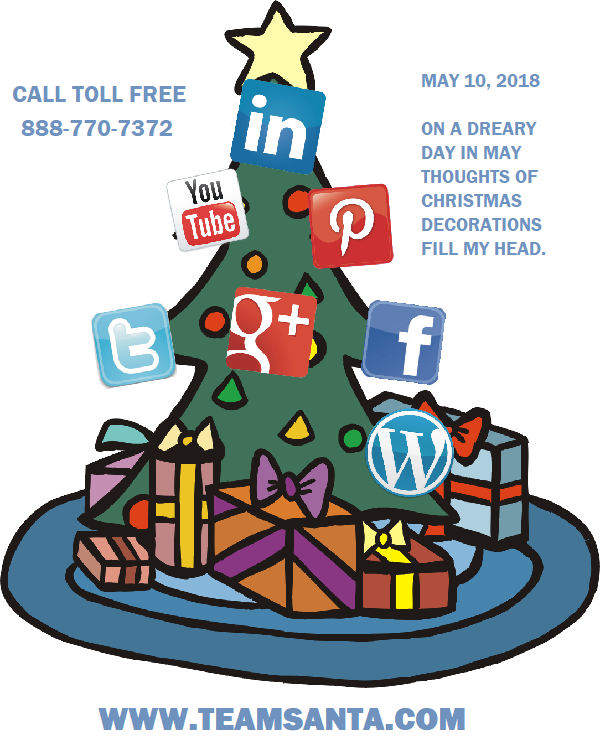 We invite to come over and check out all the new string lights and Christmas decorations for 2018. We have over a thousand skus of artificial Christmas trees. Pre-lighted Christmas tree with LED lights is very populay. 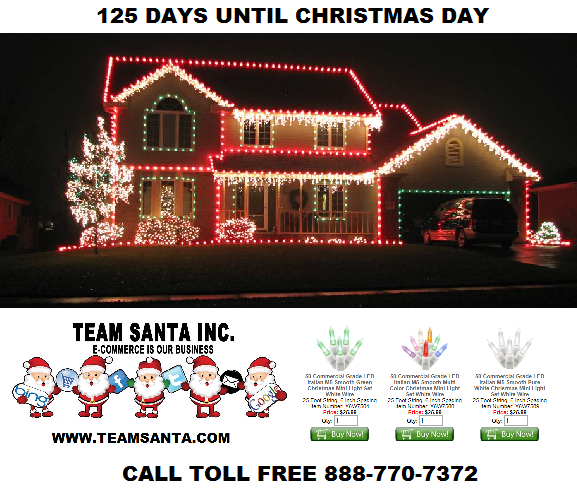 It total, over 14,000 holiday string lights, prelit, unlit Christmas trees and outdoor holiday decorations. Thank you so much for reading. We hope to see you again soon! Welcome decorating enthusiasts to the Team Santa Inc. Annual Summer Savings Spectacular. During the month of August, get low prices on everything sold on Team Santa Inc. websites. If the price is not low enough, then go ahead and take advantage of our Haggle Program, then make us an offer we cannot refuse. We also have added a wonderful new Layaway Program where you only need a small deposit to secure your entire order for the holiday decorating season. Also brand new is our Low Price Guarantee ‎promotion. This new promotion guarantees that you pay the lowest price anywhere on comparable products. Lower than Amazon, Walmart, Lowe’s, etc. 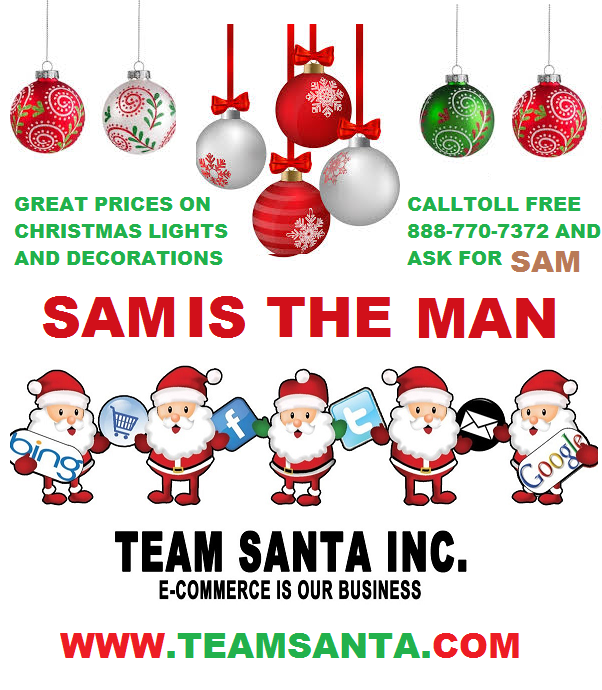 while never sacrificing the outstanding customer service you have come to enjoy at Team Santa Inc. websites. The current coupon code is “sand” (lowercase, no quotes or parenthesis). Save an extra 10 percent on everything we sell. That’s not all! Spend $75 and get free shipping too.